Mortal Kombat II was the follow up to the highly successful Mortal Kombat that is mostly credited to Ed Boon and John Tobias. 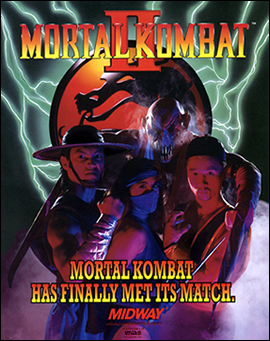 When 2D fighters were at their peak, Mortal Kombat separated itself by introducing digitized fighters played by actors, violent fatalities, and a much darker story line. While many fighting fanatics will note that the game play of Mortal Kombat is shallow when compared to the Street Fighter II variants, there is no denying that the game's gritty style and look was captivating.